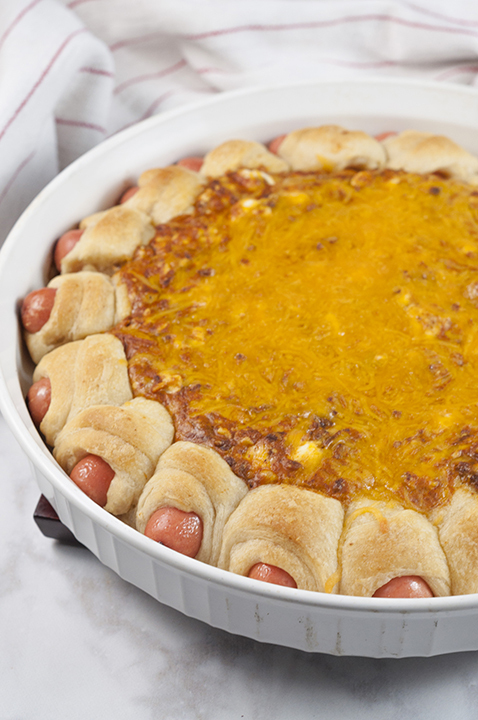 Chili Cheese Dog Wreath Dip recipe combines a cheesy, chili dip surrounded by pigs in a blanket for a show-stopping dip at your next party or Super Bowl! Unroll Crescent roll dough and cut each triangle into three even slices/triangles. Take a cocktail wiener and roll up in one of the slices of dough to form each "Pig in a Blanket". Set each Pig in a Blanket next to each other in a skillet, pie pan, or shallow baking dish, forming the circular wreath shape. Use a pastry brush to brush the top of each one lightly with olive oil. In a mixing bowl, mix softened cream cheese, chili and cheese. Pour mixture evenly into center of wreath. Sprinkle the top of the dip (not the pigs in a blanket) with plenty of extra cheese. Bake for 20 minutes, or until the dip is bubbly and the cheese has fully melted. Serve warm!